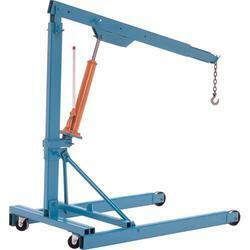 We are a leading Wholesale Trader of hydraulic floor crane from Kolkata, India. Hydraulic Floor crane : We manufacture different type of floor crane. One without counter load and second with the counter load. Mostly used in lifting and handling of pumps, motors, gearboxes, engines etc. It’s very useful for maintenance people as well as who is related to erection and commissioning of machinery. G-type models having two column position, it permits longer reach.